Bruhat Bengaluru Mahanagara Palike issued an order to M/s Manipal ETA Infotech Ltd. (Mantri Techzone Private Limited) directing the latter to stop the construction of the 72-acre project coming up on the wetland between Agara and Bellandur lakes in Bengaluru. This order comes after the Karnataka Upa Lokayukta rapped BBMP on the continuance of construction activities in spite of the lack of proper approvals from BBMP. The order, from the BBMP Commissioner Lakshminarayan, a copy of which with Citizen Matters, directed the Bommanahalli Zonal Joint Commissioner to act immediately to stop the construction, considering there are no approvals for the project. The Zonal Joint Commissioner N Muniraju confirmed Citizen Matters that the order has been served to the concerned. The project had got layout approval from the Karnataka Industrial Area Development Board (KIADB) subject to necessary approvals from the local authority. Karnataka Upa Lokayukta Justice Subhash Adi had on Friday (December 20) asked BBMP to stop the construction of the controversial SEZ project, after he came to know the SEZ and the residential buildings did not have the approval from BBMP – the local plan approving authority. Justice Adi conducted a meeting of the officials concerned on Friday December 20, 2013. Representatives of Bangalore Development Authority, Bruhat Bangalore Mahanagara Palike, Lake Development Authority, Karnataka Industrial Area Development Board, Bangalore Water and Sewerage Supply Board and others participated in the meeting. He had asked the authorities concerned to explain the nature of the SEZ and its benefits. 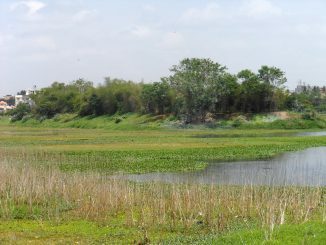 The report on Bellandur wetland by Energy and Wetlands Research Group, Centre for Ecological Sciences, Indian Institute of Science (IISc), Conservation of Bellandur Wetland, had thrown light on the dangers of encroachment of the drain and the importance of the wetland to the ecology of the area. The report was discussed at the meeting. After listening to KIADB’s version on the process of approval and sanctions, Justice Adi turned to BBMP. BBMP’s Chief Conservator of Forest, BBMP, Brijesh Kumar told Upa Lokayukta that Manipal ETA Infotech didn’t approach them for building approval. Concerned residents of Koramangala told Justice Adi that the digging and construction work is going on rapidly. Flood lights are being used to help the work continue even in the night, said one of the residents. Also, according to KIADB approval note, Manipal ETA Infotech was asked to seek approval from the local planning authority prior to the construction work. On the basis of above bye-laws, Justice Adi rapped the BBMP for not taking any action on the builders who seem to have already started construction. “What was the corporation doing when barricades were placed on the boundary and construction work began?” he questioned. Brijesh Kumar, Chief Conservator of Forest who represented the BBMP, promised to look into the matter and take necessary actions within the capacity of the BBMP. The Upa Lokayukta sought explanation from KIADB on why they ignored the letter written by LDA to them. In the letter, as earlier reported by Citizen Matters, LDA said that the project which is being constructed on the catchment area of Bellandur lake will have severe impact on the lake and the surrounding ecosystem. LDA also requested the KIADB to take back the part of the land and reserve it as a valley zone. After this, KIADB wrote to Manipal ETA Infotech, instructing them to take the necessary approvals from LDA. Manipal ETA Infotech wrote to LDA explaining their stand and willingness to take the necessary approvals. But the LDA wrote back to KIADB, stating that LDA doesn’t have any authority to stop the construction. The same letter was copied to the Principal Secretaries of Urban Development and Industries and Commerce ministries. One of the key conditions set by the Ministry of Environment and Forest and the KIADB was that, “natural sloping pattern of the project site shall remain unaltered and the natural hydrology of the area be maintained as it is to ensure natural flow of stormwater.” Also a distance of 30 metres was to be maintained from the Rajakaluve while constructing anything. Only 5 metres away from the drain! Upa Lokayukta told KIADB, that BBMP, BDA and LDA are striving hard to rejuvenate the lakes and the condition of the storm water drains mixed with sewage and untreated water was appalling. Brijesh Kumar said, “Sewage lines will have to be separated from storm water drains. A diversion of at least 100 metres is needed.” Detailed Project Reports for Agara and Bellandur lakes are in the preparation stage. During the course of the meeting, it also came to light that the amount of space required to construct the two upcoming lines will obstruct the western side construction of the project. 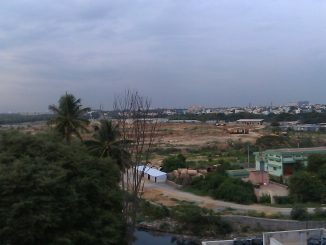 According to the Manipal Project plan, a buffer zone of 30 metres is left on the northern side of the project, above which is the Bellandur lake, while 5 metres distance is left from the drain that runs along its western side. This drain connects Madiwala lake to Bellandur lake. KIADB representative was unaware of the IISC report’s findings and recommendations on the wetland. He said, “Had I known about it, I would have taken action long back.” He also added that since procurement of land has gone through legal process from the farmers to KIADB and to Mantri with compensation, it will be difficult to take immediate action. Chakravarthi said he will take up this issue at the next board meeting. Upa Lokayukta agreed to grant time to KIADB and asked to report back within a week. Another meeting will be held later this week, in which T V Ramachandra, IISC Professor who led the research on Bellandur wetlands and the Principal Secretary of Department of Industries and Commerce will also be present. Corporates should fund elections if they aspire for better governance. However, asking favours from the winners isn’t right, feels Nandan Nilekani. Here’s the full interview for you.